The X4 Power Flash arrives Pre-Loaded with DYNO Proven tune files(limited applications) that INCREASE HORSEPOWER and TORQUE! 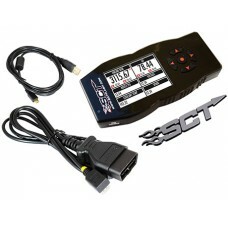 Programming your vehicle with the pre-loaded performance or fuel economy tune files is as easy as 1-2-3. Simply plug the OBDII connector into your vehicle's OBDII port, select the pre-loaded tune file using the simple to navigate menu and within minutes the X4 programs your vehicle. In addition to pre-loaded SCT tunes, CD3 offers discounted custom tailored "Tuning by James" tunes. These pick up where SCT left off by offering support for unique applications and more effective tunes. Tuningbyjames.com is one of the premier SCT tuners with years of experience and his canned tunes are consistently rated among the best available. You can choose multiple octane files at the time of purchase. Note that the higher octane tunes produce the most power. Newly added! You can get a Snap Crackle and Pop version of the regular tunes IN ADDITION to them for an extra 25$. We jokingly call them the Rice Krispy tunes. Some people love them, some people hate them. But you can't deny they are fun. And when you're done, you can flash back to the more streetable normal tune. To take proper advantage of the tune you need to have a free flowing exhaust. Note: Our James tunes require the following information. Vehicle year, engine, model, and ecu strategy code. We will also need the tuner serial number. There will be a prompt email for this once the Tracking info is sent out so there is no need to attempt to provide it up front. If aftermarket forced induction, Nitrous, or built engine tuning is required, please contact us directly.